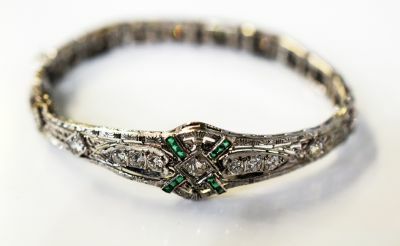 A beautiful Art Deco 14kt white gold mill grain and filigree bracelet featuring 22 old European cut diamond, est. 1.72ct (VS-SI1 clarity & G-H colour) and 12 square cut medium intense green emeralds, est. 0.12ct. The bracelet has a concealed safety clasp and detachable safety chain. It is approx. 6.5 inches (16.51cm) in length.